From the very beginning, automotive lifts have been our flagship range of products. 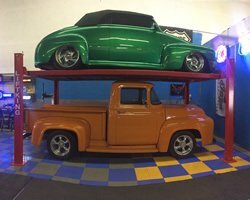 After searching diligently and partnering up with the best manufacturers in the business, we’ve served clients of many different kinds, car collectors and business owners alike. Whatever you need your automotive lift for, you can be sure that we have the perfect unit for you. We couldn’t call ourselves a team of automotive lift experts if we didn’t offer some of the best 4 post lifts out there today. 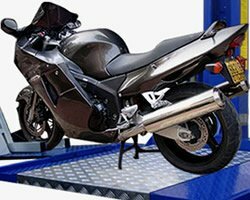 Being a staple of both service garages and home garages around the world, the 4 post lift can always be relied upon to get the job done. They’re supported at all four corners and engage the vehicle at its wheels, providing easy access to the underside and the best stability you can get. If you have the space, 4 post lifts are where you’ll really get more bang for your buck. 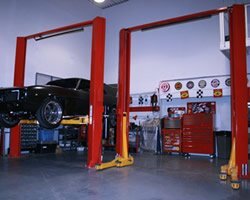 Typically used for car servicing and less often for storage, the 2 post lift is the most popular frame-engaging lift type commonly in use. The right model will offer you solid stability for a price that’s a bit more accessible than that of the typical 4 post lift. It’s great for providing quick and clear access to the underside and wheels, allowing you or your clients’ vehicles to be driven in and out of the garage for repairs in no time. Worried you’ll swing a door open and dent it on the column? Consider an asymmetric model! If economizing space is what you’re after, we have a single post automotive lift with your name on it. 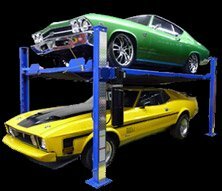 Since they’re stabilized by only one column, these lifts tend to be sought out by car lovers who don’t have a whole lot of space and want to store their prized vehicles as efficiently as possible. Installation and deinstallation are also a breeze. Single post lifts don’t fare too well with larger vehicles, so keep in mind that these are generally better for storage of the average passenger car under 6,000 pounds. 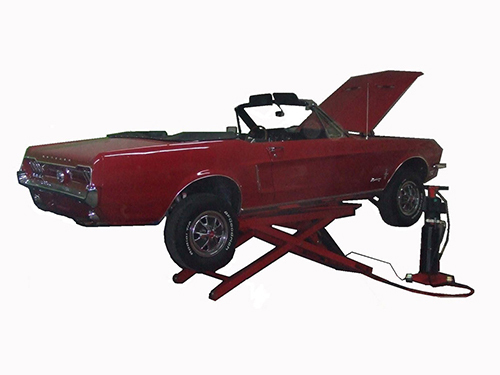 Many automotive lifts are surface-mounted and meant to be anchored to the floor. However, if you’re a home hobbyist or a mechanic who wants a more dynamic lift solution that gives you flexibility, many models allow installation without permanent mounting. Certain four post, two post, and single post models all offer portable possibilities without compromising on stability. 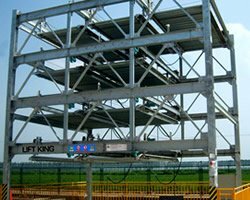 Meanwhile, if your needs are a bit more specific, Lift King’s range of specialty lifts is second to none. Our sense of quality is matched only by our variety! No matter which lift we set you up with, you can expect only the highest quality equipment and the utmost integrity of service from Lift King. Our core values are built around a dedication to providing excellent products and a great experience. As a team of automotive enthusiasts, we know how important each car is to you, so don’t hesitate to take a look at our selection today!